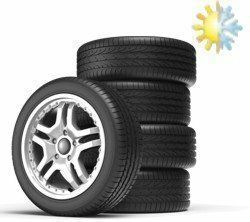 At tyres-guru.co.uk, we want to be your trusted tyre experts. That is why we do not just specialise in tyres, but steel wheels and alloy wheels as well. Check out our top-notch alloy wheels with all-season tyres today. These tyres have been tested under all kinds of weather conditions so you can always stay safe of the road. Of course, our tyres come with the snowflake symbol, which is to say that these all-season wheels and alloy rim packages have also been approved for mild winter use. However, depending on how harsh the winters in your area really are, you might want to consider alloy wheels with winter tyres for safety reasons instead. As you are shopping for alloy wheels with winter/ all-season/ summer/ offroad tyres you should pay attention to the correct tyre sizes. This is a must if you do not want to put your safety at risk. Bear in mind that we offer the handy vehicle selection tool, which allows you to choose the right tyre type/ profile/ size by vehicle manufacturer and it does not depend on your car, truck, light truck, van, or SUV. Just provide the required information, which can be found in your vehicle manual.